The Fly Agaric, Amanita muscaria, is a hallucinogen and must be considered poisonous. These attractive fungi often appear in groups and are a common sight in all kinds of woodlands. Usually recurring in the same place for several years, Amanita muscaria is found frequently throughout the northern hemisphere, including Britain and Ireland, mainland Europe, Asia, the USA and Canada. When they first emerge from the leaf litter of the forest floor, the young fruitbodies are covered entirely in pointed white warts, as seen here. As the caps expand the red pellicle shows through until eventually the cap comprises mainly red skin with white warts distributed more or less evenly across its surface. 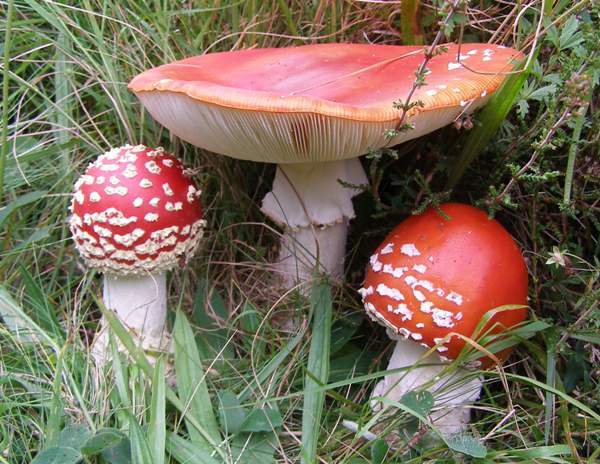 Heavy rain or even contact with animals is sometimes sufficient to remove some or all of the white flakes from the cap of a Fly Agaric, so you may see some 'bald' specimens. Amanita muscaria is an introduced species in New Zealand, Tasmania and Australia, where there are concerns that the Fly Agaric may be spreading at the expense of native fungal species. In the USA Amanita muscaria is found with the red coloration that occurs in Europe as well as an orange-yellow form, Amanita muscaria var. formosa (Pers.) Bertill., with a yellow-tinged stem and ring. (This form is seen very rarely in Britain). The common name Fly Agaric is a reference to the tradition of using this mushroom as an insecticide. In some European countries caps of Amanita muscaria are crumbled up and placed in saucers of milk to attract house flies. The flies drink the milk, which contains toxins - they are soluble in water and hence in milk also - dissolved from within the mushroom, and the flies soon become drowsy, collapse and die (or they simply drown in their spiked milk drink). The specific epithet muscaria comes from the Latin word musca, meaning 'a fly'. When Fascinated by Fungi, my new book about the kingdom of fungi and its many facets, was nearing completion I had no difficulty at all in choosing the front cover picture: it just had to be a beautiful group of Fly Agarics. The same species has appeared on other book covers in the past, I know, but that didn't deter me: my book is different and the group of Fly Agarics is very special too. Whenever I come across a perfect specimen of Amanita muscaria, the Fly Agaric, my heart leaps and I experience yet again the intense feeling of amazement that came over me so many years ago when for the first time I saw this fabulous fungus in a forest. Incidentally, I found the photogenic group of Fly Agarics (above) whose picture adorns the cover Fascinated by Fungi when wandering through the Caledonian Forest, in Scotland, where these fungi are very common and often form large groups. In Volume II of his Species Plantarum published in 1753, Carl Linnaeus named and formally described the Fly Agaric, at that time calling it Agaricus muscarius. (Most of the gilled mushrooms were included initially in the genus Agaricus!) Amanita muscaria is the type species of the Amanita genus. Christiaan Hendrik Persoon transferred the Fly Agaric to the genus Amanita in 1783. Several varieties of Amanita muscaria have been described. Amanita muscaria var. alba is a rare white form of the Fly Agaric, while Amanita muscaria var. regalis is a brown (rather than red) form of that many authorities now treat as a separate species Amanita regalis. Amanita muscaria var, formosa is familiar to people on North America; it has a yellow or orange-yellow cap with yellowish warts, and a yellowish stem. 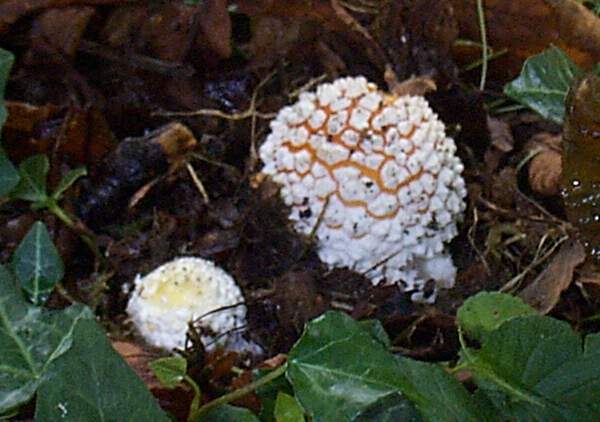 No mushroom has gathered unto it more folklore and mythology than this white-spotted fairytale fungus. Many people who have never seen a Fly Agaric are under the illusion that it is a fictitious produce of a fertile or confused mind, and that it is simply pictured to intrigue children. 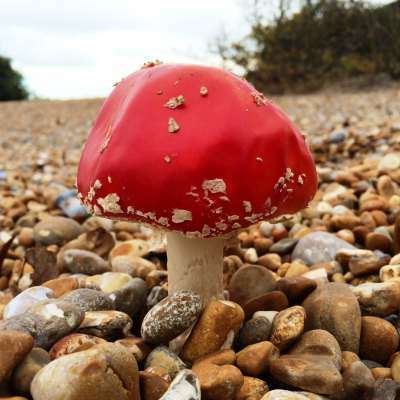 If you believe in fairies, it's not too big a leap to give credence to the existence of a red-and-white mushroom so exquisitely patterned; otherwise you may be excused from harbouring doubts about the existence of the Fly Agaric, at least until you have seen one while stone cold sober! 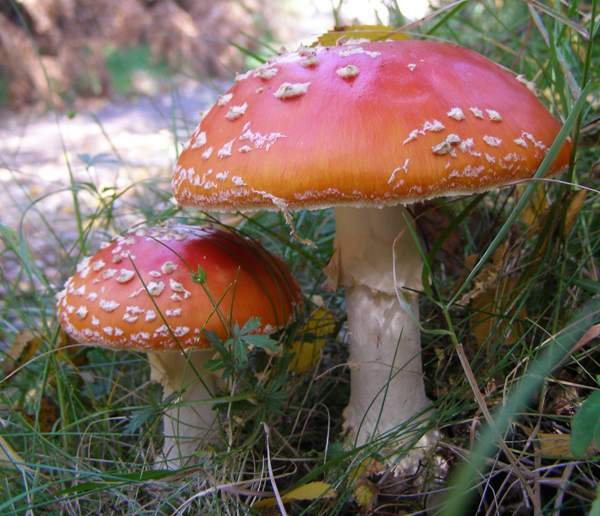 The Fly Agaric can contain the psychoactive chemical compounds ibotenic acid and muscimol as well as muscazone and muscarine (but they may not always be in significant concentrations). These are not the same as the psychoactive chemicals associated with the Liberty Cap, Psilocybe semilanceata, which is the most common (in Britain) of the so-called Magic Mushrooms; that little grassland mushroom gets (gives!) its kicks from quite different psychoactive compounds: psilocybin and baeocystin. Nevertheless, some people do still insist on referring to the Fly Agaric as a magic mushroom. The psychoactive compounds contained in Fly Agarics are also toxins, and that means that this is a poisonous mushroom, at least to some degree. Eating dried Fly Agarics can cause a range of symptoms ranging from drowsiness, nausea and sweating to distorted sight and sounds, euphoria and dizziness. 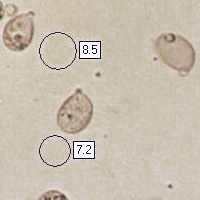 These effects are very variable not only from person to person but also with the quantity consumed and the (equally variable) strength of the toxins in individual specimens of the Fly Agaric. 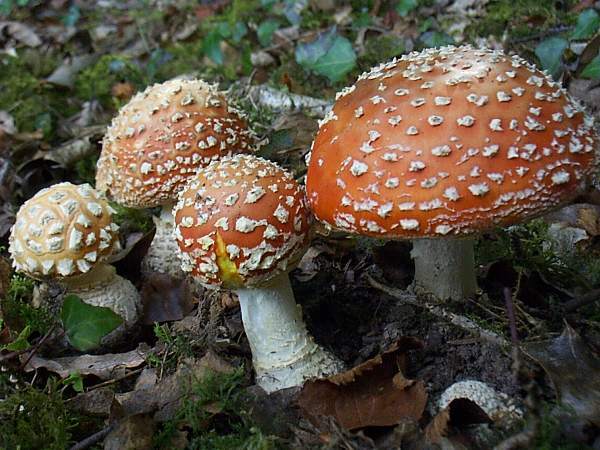 It is quite possible, although documentary evidence is not conclusive, that deaths may have been caused by using Amanita muscaria as a 'recreational drug'. 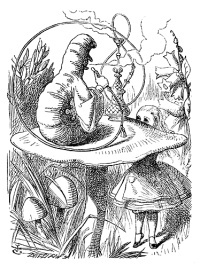 What is beyond dispute is the fact that the Fly Agaric has been known to cause severe and violent stomach upsets if it is eaten raw. I don't see,' said the Caterpillar. 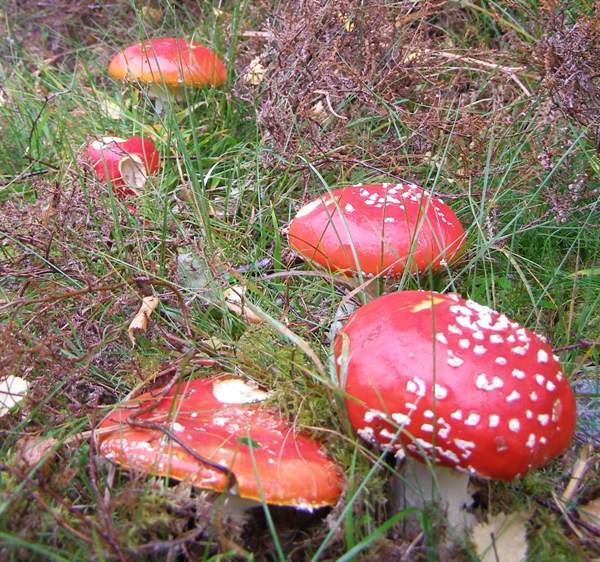 Father Christmas, or Santa Claus, has a red-and-white coat that may also be a reference to the Fly Agaric. Reindeers are known to eat Amanita muscaria mushrooms - and indeed, how else is a reindeer going to be able to fly? There are reports of Siberian people, seeing the drunken behaviour of a reindeer that had eaten Fly Agarics, slaughtering the beast in order to get the same mind-bending effects from eating its meat. 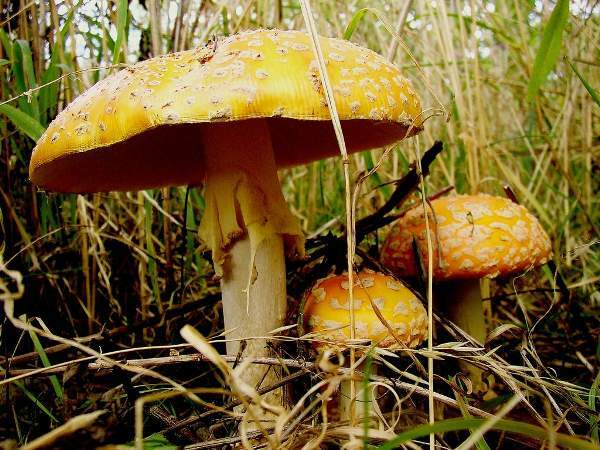 It's surely worth pointing out again that, although deaths from Amanita muscaria poisoning are probably rare occurrences, this hallucinogenic fungus contains toxins not all of which are destroyed by cooking. The two main toxic alkaloids contained in Fly Agarics are muscimol and ibotenic acid. These chemicals are mainly concentrated in the caps of the mushrooms; concentration varies greatly with age and from specimen to specimen. The lovely group of Amanita muscaria var. formosa shown above were photographed by Nigel P Kent, to whom we are grateful for permission to show this picture. 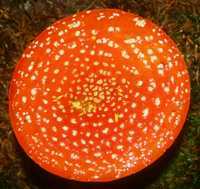 The cap of Amanita muscaria ranges from 10 to 20cm diameter at maturity; red or occasionally orange (and very rarely a white form is seen: it does not have red spots, although some picture-book Fly Agarics are depicted in this way!). Caps usually flatten or even become slightly concave when fully developed, but occasionally the Fly Agaric remains broadly convex. Caps of the Fly Agaric usually retain irregular, white fragments of the universal veil, but in wet weather they can wash off even while the caps are young and domed - as see on the left. In all but the driest of weather, Amanita muscaria caps flatten at maturity. When damaged, the flesh just below the pellicle (the skin of the cap) of a Fly Agaric is initially white but soon turns yellow on exposure to air. Amanita muscaria has white, free, crowded gills that turn pale yellow as the fruitbody matures. Fly Agaric stems are 10 to 25cm long and 1.5 to 2cm in diameter; white and ragged with a grooved, hanging white ring. The swollen stem base retains the whiteemains of the sack-like rvolva, which eventually fragments into rings of scales around the base of mature specimens. 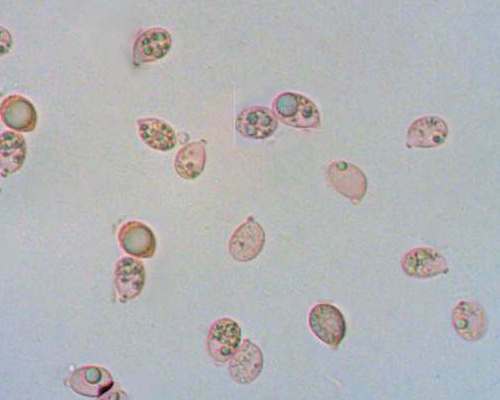 Ellipsoidal; 8.2-13 x 6.5-9μm; inamyloid. 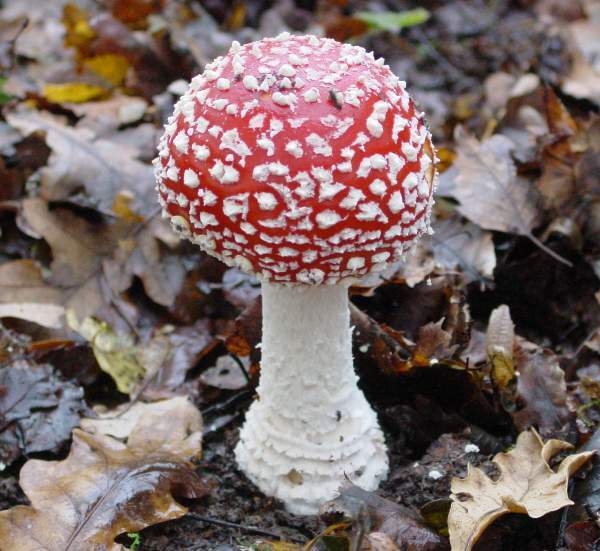 In common with most Amanita species, and with all common amanitas that occur in Britain, Amanita muscaria is ectomycorrhizal. The Fly Agaric forms mycorrhizal associations with a range of hardwood and softwood trees, notably birches, pines and spruces. 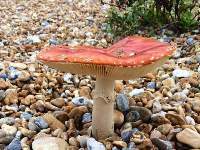 The remarkable picture on the left shows a Fly Agaric growing on seashore gravel - presumably mycorrhizal with the Sea Buckthorn shrub in the background. This picture was taken near Walmer in Kent UK by Harriet Barnes, with whose kind permission it is shown here. Amanita caesarea (Caesar's Mushroom) is rarely if ever found in northern Europe; its cap is brilliant orange with a striated margin, and the stipe is yellow. 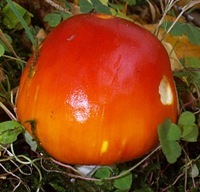 The caps of some samples of Amanita rubescens are deep orange, but their stems and their cap flesh always turn red when damaged. Russula nobilis (Beechwood Sickener) has a bright red cap but no ring and no volva; it is very brittle. Fascinated by Fungi, Pat O'Reilly, 2016. Geoffrey Kibby, (2012) Genus Amanita in Great Britain, self-published monograph. This page includes pictures kindly contributed by David Kelly and Nigel Kent.